Setting a precedence, GREX continues to push the limit with its popular line of 23-gauge headless pinners. 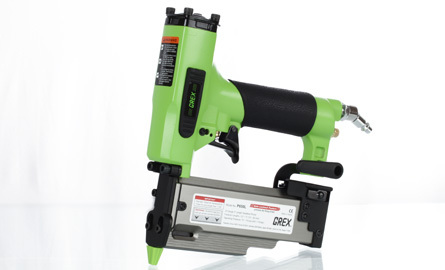 First of its kind, the GREX P650 sports a 2" fastener capability. Now you have the ability to drive even longer fasteners into soft or hardwood with the same great quality and features expected from GREX. High Tolerance - Posit-Lock™ Nose Cover: The high tolerance precision machined hardened steel driver, nose cover and nose guide assembly aligns and seats the headless pin for optimal drive performance. What is Posit-Lock™ - it's tight tolerance, durability and functionality that reduces jams to a minimum. Performance Enhanced Innovative Patented Magazine: The GREX P650 sports a lightweight aluminum (not plastic) extruded magazine; stair-stepped magazine, increasing access to tighter areas and more angles; automatically adjusts to pin size, accepts headless pins from 3/8" to 2"; a rear magazine cap allows for both hex wrench and spare no-mar tip storage; has a durable yet operator friendly magazine latch; and last but not least a fastener supply window showing pin supply. What's more: A swivel disconnect, prevents air-hose tangles; detachable no-mar tip, prevents project damage; the no-mar tip has four sight guidelines, increasing pinning accuracy; side bumpers, prevent tool and project damage; convenient belt hook; and rear exhaust using a silencer. Still more: Working high up on a ladder or pinning overhead, take a look at our GREX P650L.